Lack of standalone options may turn some off. Go for the V-6, but don't expect to find a bargain on a used Frontier; they may be dated, but they have stellar resale values. Thoroughly outpointed by its rivals, the 2017 Nissan Frontier is nonetheless worth a look if you value its nimble feel and its surprisingly good value. 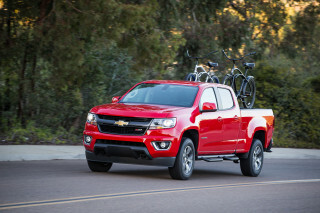 Mid-size trucks have made a serious comeback in the last few years, with the Toyota Tacoma, GMC Canyon, and Chevrolet Colorado all making news every year with redesigns, refreshes, and major updates. But what about the Nissan Frontier? It's still hanging in there, awaiting an upcoming redesign. Its basic bones date back more than a decade, but despite its age, it remains popular with buyers. What's drawing them in? Well, it's a combination between value, size, and perceived durability. Five flavors are on offer: S, SV, SL, Desert Runner and PRO-4X. That doesn't mean it's not worth shopping; quite the contrary, it's something of a classic in its own time. Two cabs are offered, the King Cab (think extended cab) and the Crew Cab. With four doors and good rear seat space, the Crew Cab is the clear choice for Frontier shoppers who need to transport more than two people regularly. All King Cabs feature a 73.3-inch bed, while the Crew Cab offers a choice between 59.5- and 73.3-inch beds. A chrome-heavy front grille is augmented for 2017 on base S models by a new painted rear bumper. Inside, the Frontier's look is chunky and boxy, with no shortage of hard plastics. SL and PRO-4X models are available with leather seating surfaces that are surprisingly high quality, however, so it's possible to dress up your Frontier considerably. The driver and front passenger are treated to upright, comfortable seats, but the manual seats standard on most models don't include a height adjustment. Tall drivers may find the high floor level requires a legs-out seating position. The second row consists of jumpseats on King Cabs that aren't suitable for more than short trips, but the Crew Cab has decent room for adults even if the backrests are way too upright. Under the hood, there's a choice of a 261 horsepower, 281 pound-foot of torque 4.0-liter V-6 engine or a 152-hp, 2.5-liter inline-4. The V-6 is the star of this show, with pep and pulling power that's almost equal to some smaller V-8s. Improvements have boosted gas mileage slightly over the years, helping to keep the V-6 competitive if certainly not class leading. 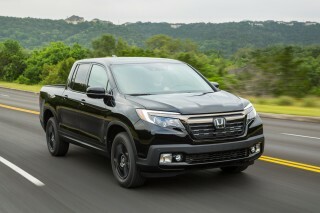 The 4-cylinder is OK for the commuter who occasionally needs a pickup, but it's ill-suited to heavier duty, and isn't that much cheaper or more efficient than the V-6. Both 4x2 (rear-wheel drive) and 4x4 drivelines are available in the Frontier. In 4x2 guise, 4-cylinder models offer a choice of 5-speed manual transmission or 5-speed automatic; V-6 models can choose between a 6-speed manual or 5-speed automatic. If you want a 4WD Frontier, the V-6 engine is your only option, mated to either a 6-speed manual or 5-speed automatic. All Frontiers ride a relatively simple suspension setup with independent double wishbones up front and a leaf spring setup holding in a solid rear axle out back. Opt for the Pro-4X or Desert Runner and you'll get Bilstein shock absorbers and a manual locking rear differential. Even with its all-terrain tires, the Pro-4X is the best-riding Frontier. Most Frontiers stretch 205.5 inches from head to toe (the long bed Crew Cabs come in at 219.4), giving them smaller dimensions than most rivals. That may rob them of some interior space, but it endows these pickups with terrific around town maneuverability for a truck. The Frontier earned top marks of "Good" in moderate overlap front-impact, side-impact, and roof strength tests from the IIHS. Federal officials haven't rated the truck beyond a calculated rollover score, for which the Frontier earns three stars with rear-wheel drive and four with four-wheel drive. The Frontier lacks any sort of collision avoidance tech, unlike most of its rivals. The base Frontier S is basically a work truck; it lacks power windows and mirrors, and has a limited number of options. The SV is designed as the mainstream model, adding those features plus alloy wheels. It also offers a reasonably-priced package that includes unexpected niceties like heated seats, a leather-wrapped steering wheel, a rearview camera, automatic climate control, a spray-in bedliner, and an alarm system. SLs build on that with a Rockford Fosgate audio system, navigation, heated seats, and chrome exterior touches. The Desert Runner is designed to be a dune-bashing truck; it's rear-wheel drive-only, but it includes its own suspension and styling. The Pro-4X, meanwhile, builds on the Desert runner with a few more convenience features plus four-wheel drive. No Frontier is especially thrifty, but 15 mpg city, 21 highway, 17 combined for the four-wheel drive automatic model isn't terrible. 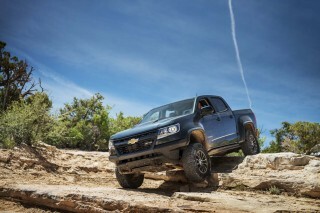 All models can tow upwards of 6,000 pounds, with rear-wheel drive long wheelbase Crew Cabs topping out at 6,500 pounds. Having been on the market for a decade, the Frontier is a little too familiar now. Familiar and comfortable like a three-day beard, the Nissan Frontier manages to look pretty good despite an increasingly large amount of grey hair poking through. Function-first design dominates the Frontier's lines, inside and out. It's buff and brawny for its size, and it's easily the simplest design of the smaller trucks—though some of us like the square-jawed look of the GMC Canyon best of all. Car-like fenders swell and curve at the wheel wells, separated at the nose by a grille that, while attempting to blend into its surroundings, comes off as a bit of an afterthought. The cabin, meanwhile, lacks the charm and warmth that GM in particular has baked into its trucks. The Frontier's cockpit is simple and clean, but it feels as old as it is. And its center console has a few nooks and crannies not deep enough for real item storage; they look more like blanks for items you forgot to order than proper storage bins. Compared to the other mid-size (and full-size) trucks, there's a less substantial feel and a lot more hard plastic. With its big tires, the PRO-4X is the best-riding Frontier—and it's an impressive off-roader. The Frontier is best experienced with its V-6 engine and one of its two off-road packages, which boast high-quality shock absorbers and big tires. In the 4-cylinder Frontier, there's a miserly 152 horsepower available from its 2.5 liters of displacement. Straight-line performance is barely adequate: it strains to hit highway speeds. What's worse is gas mileage that's hardly better than the V-6—it tops out at 23 miles per gallon highway, just a couple of points higher than the V-6. Opt for this engine only if you're looking to use your Frontier around town. 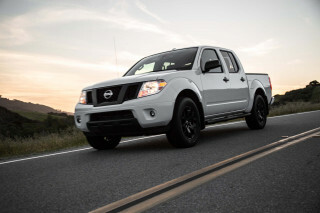 Step up to the 4.0-liter V-6, however, and the Frontier changes its tone dramatically. The V-6 kicks in 261 hp and 281 pound-feet of torque that makes it feel downright quick when unloaded, and easily up to the task of its working side. The V-6 Frontiers are rated for up to 6,500 pounds of towing capacity when appropriately configured. The V-6 does thrum at idle more than we've come to expect from modern pickups, but it's quiet otherwise. The V-6 is also available with a choice of manual or automatic transmissions. Most will opt for the automatic, and the 5-speed gearbox does a fine job matching the Frontier's power, torque, and use. The 6-speed suffers from long throws, but we applaud its availability. You can order up the manual gearbox on either a rear-drive S or a four-wheel-drive SV or Pro-4X, and dealers should have both transmissions in stock. Many mid-size truck buyers aren't just looking for better gas mileage or lower prices—they often need better maneuverability as well. With the Frontier, you'll get it, but only up to a point; steering is good and the suspension controls the body well, but it can get choppy and harsh over broken surfaces especially with an empty bed. We find the firm steering to be surprisingly direct, which helps this pickup become somewhat entertaining on winding roads. Both rear-drive and four-wheel-drive options are available, though 4WD is limited to V-6-powered models. That 4WD system is a part-time unit not intended for use on dry pavement, however. Off-roaders will find much to like with the Pro-4X, which includes a locking rear differential to help get you out of a particularly sticky situation. 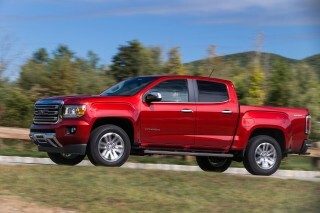 Only high-end models offer a height-adjustable driver's seat and even crew cabs are tight in the rear. Front seat passengers are treated to terrific visibility and seats that are almost lounger-like comfortable, but you'll have to spend extra to get a height-adjustable driver's seat and the rear is best for kids regardless of body style. While the Frontier is mid-sized, it's certainly large enough for most folks. It's easy to enter and exit thanks to its slightly lower-than-full-size height, and the front seats are supportive and comfortable upright. Visibility is good throughout the Frontier range. One demerit is that the driver's seat is only four-way adjustable unless you pop for the power seat; it's included on the SL and is grouped with leather on the Pro-4X. Previously, certain Frontiers included a manual height-adjustable driver's seat. King Cab Frontiers get a pair of rear-hinged doors that open up the area behind the front seats for more cargo and a pair of jump seats—but the jump seats are best reserved for kids, and small ones at that. 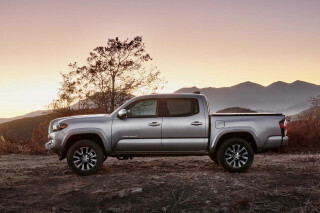 The Crew Cab models get four full-size doors that accommodate smaller adults, with a three-across second-row bench that's only tight on elbow and shoulder room when fully loaded. That rear bench on Crew Cabs is also especially upright, which degrades long distance comfort even further. Hauling things is a truck's job (at least in part) and the Frontier delivers with cargo-related features. A stout frame, beds up to 6 feet in length, and a factory spray-in bedliner make for a rugged, if residential-sized, work space. An available Utili-Track cargo tie-down system is very handy for those regularly hauling weekend projects or outdoor gear. For 2017, even the S is now available with a factory spray-in bedliner. One of the Frontier's biggest downfall is its dated, plasticky cabin. Without real change for the past half-decade, it's aged quickly—especially in fit and finish. Back-to-back comparisons with the GM and Honda mid-sizers show how far ahead rivals are in a comfortable, relatively high seating position and richly textured materials. Then again, a loaded Frontier tops out around $37,000, with comfortably-equipped SVs listing for a more reasonable $32,000. That's easily $3,000 to $8,000 less than rivals, which makes it easier to forgive some of the Frontier's gaffes. We don't have all the crash test data yet for the Frontier, but what's there has been positive. While the 2017 Nissan Frontier has performed well in the IIHS crash testing—better than some newer design rivals. 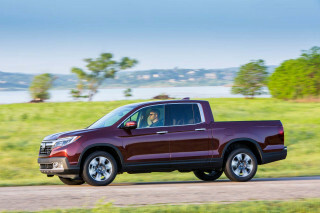 However, the Frontier lacks the advanced safety tech available on its Honda and GM rivals. The crash data that is available isn't bad. Federal officials don't have any ratings for the current truck, but the IIHS gives it "Good" scores for the tests it has performed—save for an "Acceptable" rating for head-restraint protection. There's no score for the challenging small-overlap crash test, though. A rearview camera and sonar parking sensors are available on the SV and standard on the SL, Desert Runner and Pro-4X, and hands-free Bluetooth phone connectivity is included on all models. Frontier isn't available with as many options as its rivals, but it offers good value and trim levels are well-packaged. You won't spend all afternoon going through the Frontier's available trim levels like you might on its rivals, but what packages Nissan does offer make sense and seem well-tailored. All models are available in either King Cab or Crew Cab configurations. The V-6 is standard on all except the base rear-wheel drive S and SV models in King Cab configuration; all Crew Cabs are V-6. Most models come standard with an automatic, but Nissan offers its 6-speed manual on the SV and Pro-4X Crew Cabs with four-wheel drive, as well as on the base S.
In terms of bed length, all King Cabs feature a 73.3 inch bed. That long bed is also available on SV and SL Crew Cabs with four-wheel drive, and on SV Crew Cabs with rear-wheel drive. Otherwise, Crew Cabs feature a 59.5 inch bed. 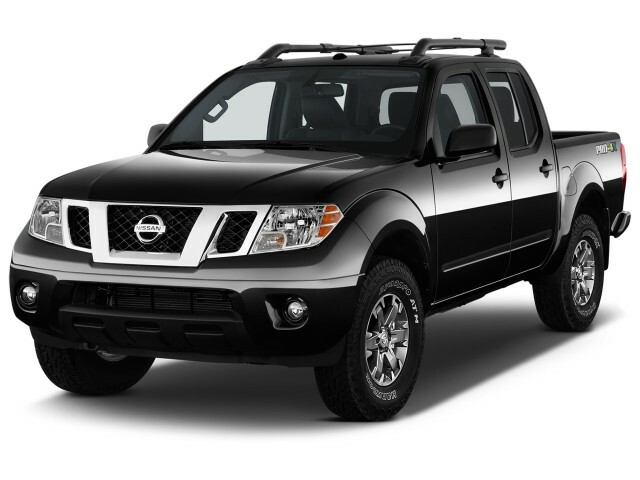 Frontier S models are the workhorses of the range, minimally equipped. They include Bluetooth streaming audio as well as air conditioning and cruise control, but power windows and locks aren't available. For 2017, S models are newly available with what Nissan deems its Work Truck package: a spray-in bedliner, rubber floor mats, mud flaps, and caps on the bed rails. The SV is more mainstream, including power windows, power locks with remote keyless entry, and alloy wheels. 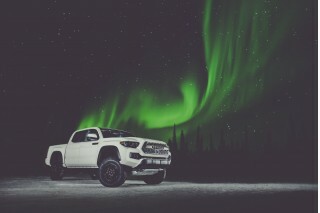 For about $2,000, a Value Truck package adds some surprises: dual-zone automatic climate control, a leather-wrapped steering wheel, heated seats, a spray-in bedliner, an automatic dimming rearview mirror with a compass, fog lights, tracks in the bed floor for holding down items, a backup camera, and reverse sensors. It strikes us as a worthwhile package. SLs add to the SV leather seats, an eight-way power driver's seat, a four-way power passenger seat, Rockford Fosgate audio with navigation, side steps, and the features of the SV's Value Truck package. A moonroof is the only option on SLs. Active lifestyle types can choose between the rear-drive Desert Runner or the four-wheel drive Pro-4X, which both include all-terrain tires and Bilstein shock absorbers. The Pro-4X is a little more feature-packed with a rearview camera, heated seats, and a locking rear differential. Pro-4Xs are also available with a package that includes leather seats, a moonroof, and a roof rack. The Frontier's fuel economy has more in common with full-size trucks than mid-sizers. Given its age, we shouldn't be surprised that the Frontier hardly offers class-leading fuel economy. The rear-drive, 4-cylinder Frontier rates as high as 19 mpg city, 23 highway, 21 combined when equipped with the 6-speed manual transmission. Opting for the 5-speed automatic brings those figures down to 17/23/19 mpg. With the V-6, the rear-drive Frontier rates 16/22/19 mpg with a 6-speed manual, or 16/22/18 mpg with the 5-speed automatic. The V-6 engine is standard on four-wheel-drive versions of the Nissan Frontier. Manual versions score 16/21/18 mpg; with the automatic, it rates 15/21/17 mpg. Great mid-size truck and best bang for your buck if on a fixed income.